Home with Baxter: House Tour - Week 5 - Half Bath/Laundry Room Reveal! House Tour - Week 5 - Half Bath/Laundry Room Reveal! Happy Friday! I know it's been a couple of weeks since I've done a "house tour" but I have something good for you guys this week. I finally got around to photographing our newly renovated half bathroom/laundry room. It's officially done! Here are some photos to show you where we started. It was so bad we just had to laugh about it. After 1 1/2 years of laughing we got tired and decided we had to do something about it. 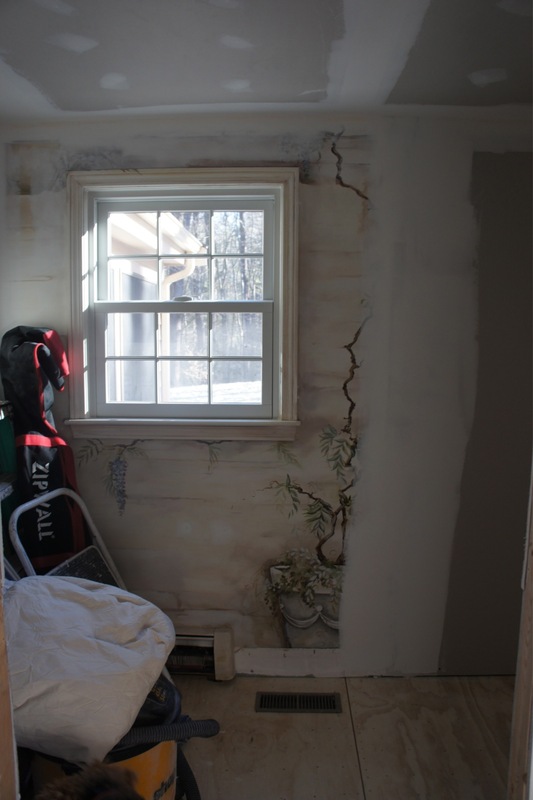 We hired L&M Construction to tear this room apart and help create my vision for the space. They removed the flooring, frame for the laundry closet, sink, toilet, and light fixtures then put up some new drywall and a new ceiling. We had new Carrara marble hexagon floors installed as well as a new pedestal sink, toilet, light fixtures, beadboard, formica countertop, and cabinets. (See this post for more information about the floors and this post for more on the sink and toilet). Jake and I hung a new mirror, drying rack, and shelf and painted some of the beadboard gray. I am so happy with how this little room turned out! You can check out past weeks of my house tour here. Have a great weekend! This looks amazing!!! So clean! Thank you Melissa! I actually sort of enjoy doing laundry now. This is beautiful! 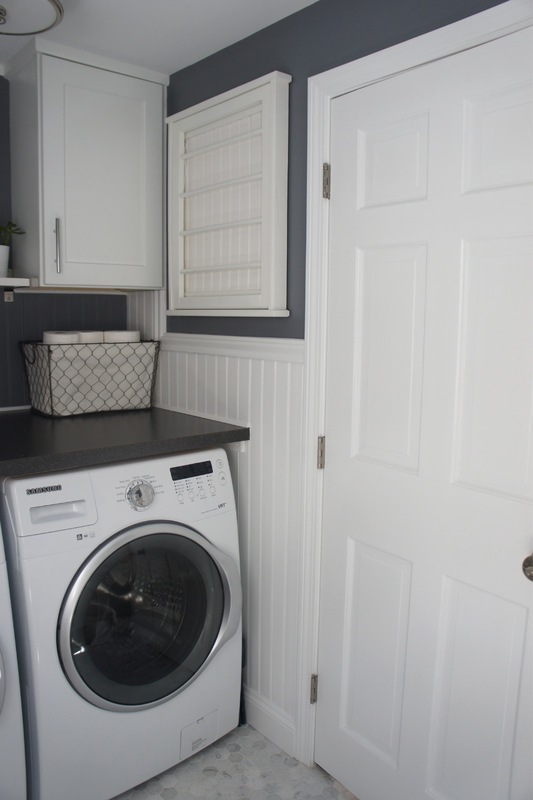 I love how you painted the beadboard behind the washer and dryer. It really makes all of the white cabinets and the appliances pop. You must be so happy with how this turned out! Thanks Steph! Painting the beadboard behind the washer and dryer gray was a last minute decision. I'm so glad we did it. I really love the contrast it adds. Beautiful! Everything is perfect. Even the print with the yellow bathing suit; so cute! Jessica, your bathroom/laundry room came out so beautifully!! You know I have the same space and I am loving what you did with it! The floor, the colors, and all the details are perfection! Hi, I love your bathroom! Can you tell me what colour of paint you used? We are looking for something just like it! HI Katie! We used Benjamin Moore Rock Gray. so glad someone asked this question...L.O.V.E this bathroom/laundry room!!!! Hello! 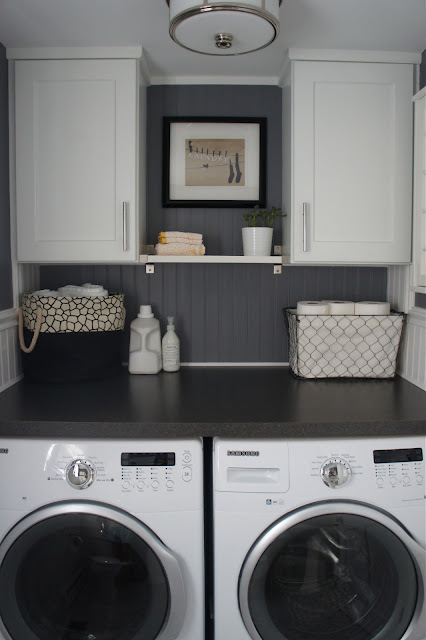 Can you tell me about the counter top above your washer and dryer? What is it and how did you do it?? Thanks!!! Hello. Can you tell me about the counter top above the washer and dryer? What material is it and how did you mount it?? Thanks!!! Hi Nicki! The countertops are Formica laminate (http://www.formica.com/en/products/laminate-homeowner?dfs=&st=2&df=Patterns&f=) I chose the Smoke Quarstone pattern. We had contractors install the countertops for us. I'm not exactly sure how they did it, but it looks like they drilled wood support pieces on all three walls and then drilled the countertop to the supports. Thank you! Yes....interesting it was. I totally agree with you! Whoever painted the mural has some real talent. 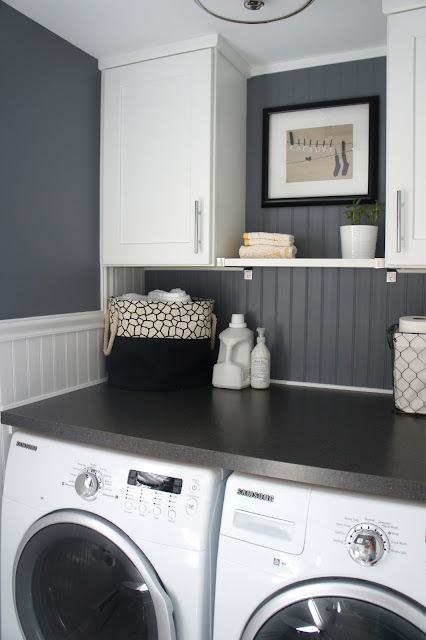 Love the cute little print above your washer and dryer. Can you tell me where you bought it or did you paint it? Your bathroom is beautiful! Thank you! I found the print at my local HomeGoods. This looks awesome! You should link up another one of your spaces to Design in Your Home! I LOVED your office :) Be sure to add a featured button on there! Fantastic! I love all the details! Especially your laundry dryer on the wall and counter top over the washer & dryer! Thank you Jo-Anna! The counter over the washer and dryer has been great. There's a *chance* I'll actually fold laundry now! Congrats on your Thrifty Decor Chick feature! You've got great taste. Thank you, Sharon. You're always so sweet! Lovely! Can you tell me where you purchased your mirror! Love it! Thanks! Lovely! Can you tell me where you purchased your mirror! Thanks! This is amazing. You have such beautiful taste. Please! Oh Please...Tell me where you purchased the vanity light. I am currently re-doing our guest bathroom and this just went to the top of my must have list. You have a beautiful home and have done an amazing job so far. Can't wait to see all the other changes. Thanks so much. Hi - do you know the brand and name of the gray color that you used on the walls? It's Benjamin Moore Rock Gray. Can you share your source for the mirror. I'm about to start remodeling our half bath and I think that mirror would be perfect. Love all that you've done in this room. Thank u! It's the Kensington pivot mirror from pottery barn. See link above. Did the two pieces on the side of the mirror come with it, or did you purchase them separately? I am having trouble finding a mirror to go over our wainscoting. Okay, this is TOTALLY my itty bitty laundry room, right down to the cramped space and open shelving. Can you give more details like where you got the cabinets, what you did for the shelf, that awesome space saver drying rack, etc? I would love to do something similar. Hi Joanna! The shelf and bracket are from Ikea. I don't recall which one it is, but it's nice because you can cut the shelf to whatever size you need and the brackets hide the rough edge. The cabinets are from Thomasville and they are the Cabbott style in white (http://www.thomasvillecabinetry.com/Style26/Cabbott.aspx). The drying rack is from Ballard Designs (http://www.ballarddesigns.com/beadboard-drying-rack/240371?redirect=y). It's a bit on the expensive side so if you're looking for a cheaper option I know some DIY bloggers have replicated it. A search on Pinterest will probably turn something up. I wasn't up for the challenge, so I shelled out the mulah for it, but it works great. looks great, what brand/color is the grey paint and where are the cabinets from ? what model name are the cabinets?? Thanks! The paint is Benjamin Moore Rock Gray in Eggshell finish. The cabinets are from Thomasville and are the Cabbott model: (http://www.thomasvillecabinetry.com/Style26/Cabbott.aspx). What a transformation! I love your style and the colors. Love the laundry remodel. A truly functional and beautiful space. Enjoy. Love it! How did you "hide" the water lines to your wash machine? Thank you! 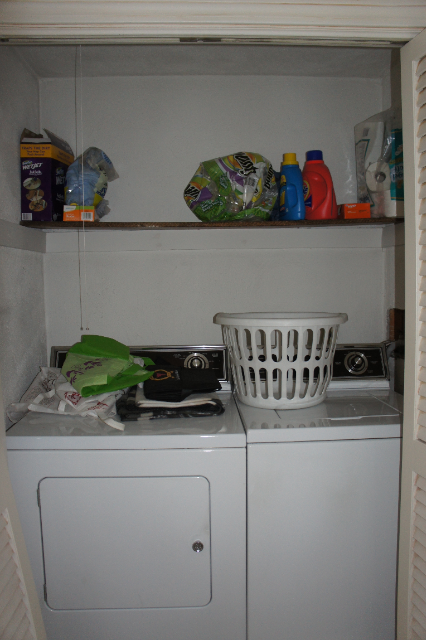 The water lines are on the wall to the right of the washing machine, towards the back. We put a "nice" cover around them so if they were visible they wouldn't look as bad, but you really can't see them at all. I dropped in from the link featured on Hooked on Houses. I like the floors and they look beautiful, however I have a practical question for you. I've always heard that marble is high maintenance and not very resilient, although I haven't done much research on it lately. I don't have any practical experience with it, so I tend to wonder about it given what I've heard. Perhaps it's too soon to tell given that your remodel is so recent. I also wonder if the floors might feel cold during winter. I live in a cold climate, but I have a crawl space and no basement, so I tend to wonder if the floor would feel cold during winter and I wouldn't much like that. I love the beadboard too and that is something that I've also thought to use in my bathroom as well. I've had some condensation issues in my small older bathroom, so I'm somewhat reluctant to use it. I also like your laundry remodel. That's on my agenda too, but down the road, so I'll bookmark this page. Very nice remodel. I've heard the same thing about marble so to tell you the truth I was a little hesitant. I talked it over with my contractors (one of whom has carrara marble in his powder room) and they reassured me it would work okay. Marble is porous so if something is spilled on it, it needs to be wiped up immediately or you run the risk of it staining. This is why I personally would never put marble countertops in my kitchen even though I love the look. I felt that there wasn't much I would risk spilling in the powder room except for maybe laundry detergent? I did put a small rug in front of the washer and dryer to be on the safe side. The floors are easy to clean; I just use my normal floor cleaner. I haven't had an issue with the floors feeling too cold, but we have tile/wood floors throughout our house so maybe I'm just used to it. Another reason why I was comfortable using marble in this room is because it doesn't have a tub/shower so there's no worry about the floors getting slick from condensation (which is another concern with marble). For the beadboard, we actually didn't use standard wood beadboard, we used a product made of MDF that's made to look like beadboard. It's more affordable and it's paintable. I would think that it would hold up better to condensation than wood, but again condensation isn't an issue in my space. Good luck with your remodel! Hi Jessica, your bathroom looks amazing! Would you mind sharing the dimensions of the room? I'm working with a very similar space and I really like the layout you have. Thanks! Thank you! The room is roughly 5' x 8'6". Not big! In reference to the water lines......so is the countertop above the lines? Ours are on the right also, but between leaving room on the side and back (for the water line) how do you fit the countertop to the walls. Above the lines? Then there is a huge gap between the top of the appliances and the countertop. Maybe your line connections are lower? Thanks for the help. Yes, in my case the water lines are below the countertop. The hookup is on the right wall and is a bit lower than the top of the washer so we didn't have to worry about a gap. If your lines are higher, I suppose you could always drill a hole through the countertop to feed the lines through and then place a basket or something on the counter to hide them. Or, you could keep the water lines below the countertop and just put baskets or something above the washer and dryer to fill the gap, but I don't know if that would make your countertop too high? I think your transformation is amazing! The bathroom has a much more classic and long lasting feel to it and good riddance to the mural! I also love your formica top on the washer and dryer -- I should have figured that out myself a long time ago! Lucky you that you don't have to look for socks and t-shirts that have fallen behind the washer and dryer when you pile things on top! Thank you so much! I was going for a more "classic" look though I do know gray, white, and yellow is very trendy right now. 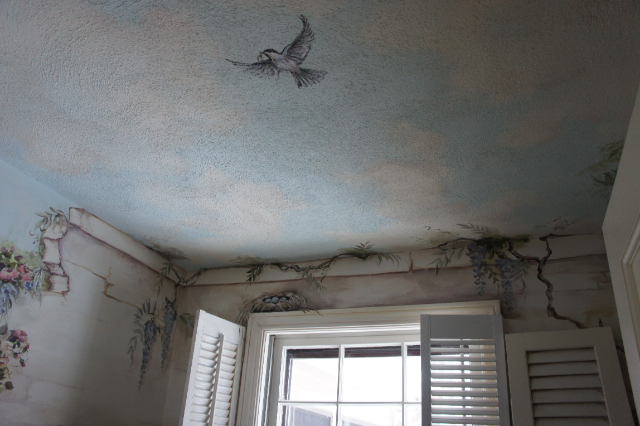 If I get tired of it in a few years, I'm hoping I can just repaint the walls and still have a look I love! Love love love! As grey becomes the "new" taupe, I am surprised at how warm it feels! Excellent remodel... although your bar wasn't set extremely high from the beginning.... LOL! Oh it just makes your wonder what people are thinking sometimes! I have been begging my husband for a countertop and shelf over our washer and dryer but he's concerned about the dryer hose being squished as well as not having access to behind the appliances. I have seen a ton of laundry rooms that do it so I think I must have an overly concerned hubby (which is okay i suppose, better safe than sorry right?) but i really would make life easier and soooo much cuter!! Just curious if those things came up as you were planning. Thanks for sharing your beautiful home! Thank you! And I would agree, the bar was not set very high! :) Easy for me...) We bought a compact dryer hose so it doesn't get kinked or squished behind the dryer (I was a little worried about that too). The washer hookups are to the right of the washer and again there's space for them. I think it's fine to go with the countertop as long as you leave sufficient space in the back and on the sides and can slide the appliances out quickly in a pinch. 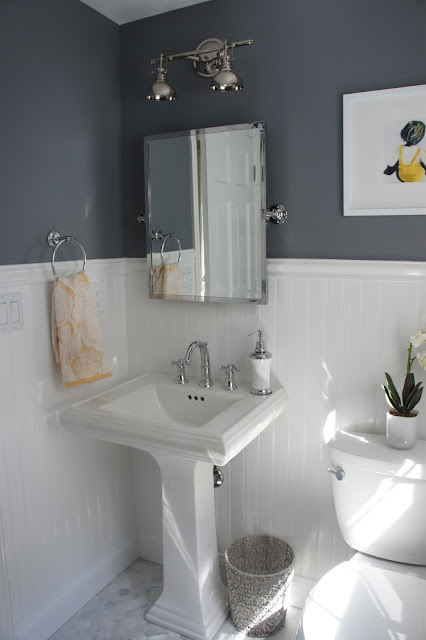 Jessica, your half bath/laundry turned out amazing! I think you definitely made the right choice getting rid of the mural :). I saw in the comments that you painted this Benjamin Moore Rock Gray. 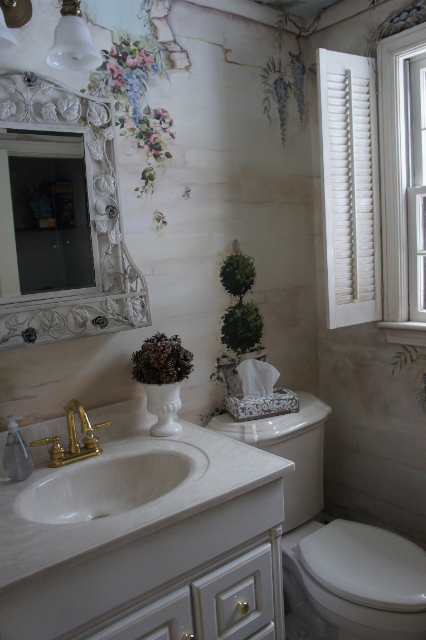 It looks great with the marble and beadboard, and I'd love to feature it on my paint color blog, Involving Color. Let me know if you're interested! How deep is your laundry area? Do you miss the laundry tub? Could you share the dimensions of this room? My house currently has a laundry closet that shares a wall with a bedroom and bathroom. We have gutted out the bed/bath and have no intention of adding back the full 3rd bathroom to our house because it is unnecessary. 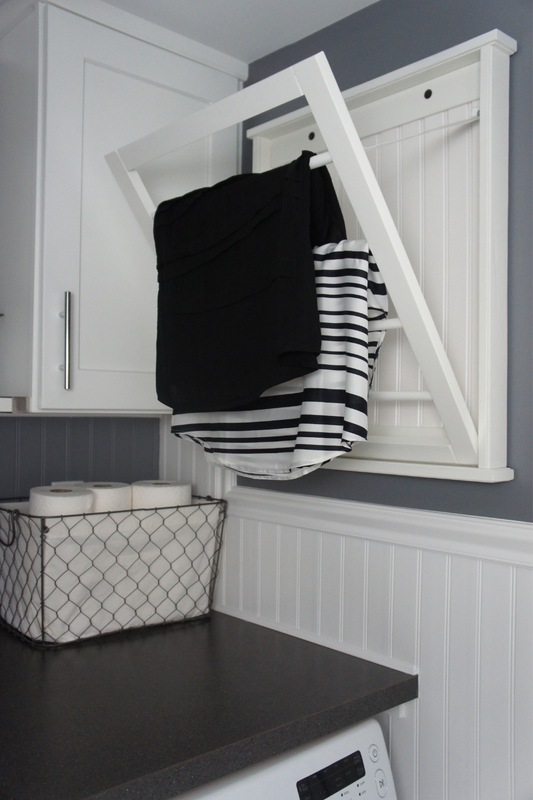 We do however like the idea of the half bath for guests and have decided to incorporate it into our larger laundry room. I like the layout of how you have laundry on one side and bathroom on the other. I'm wondering if your layout will work in our type of space. Do you find there is enough room when dryer doors are open and baskets with clothes are hanging around? Or does it feel cramped? The room is roughly 5' x 8'6". There's no real room to have baskets on the floor (the bathroom door would swing into them), but there's ample room on the countertop to store them there. Ideally, the room would be a bit larger, but we had to work with the space we have. Removing the laundry "closet" and making it one big room definitely makes it feel larger. Wow! I love the bathroom redo. I am thinking of doing something similar with my own 1/2 bath. Can you tell me the dimensions of your bathroom? Also how do you like having the laundry in your bathroom? Ours is currently a closet in our kitchen that I hate! Thanks, Laura! The room is 5' x 8'6". I love having laundry in the bathroom. I'm used to having it in the basement so this is great! Hi! Thank you! Yes, you simply need to slide the units out to unhook everything. We left a little space in between and on either side of the washer and dryer (as well as on top of them) so we can get our hands around them. Love everything about this room! What a wonderful space! I Love the little yellow print. Would you be able to share where it came from? Thank you so very much! 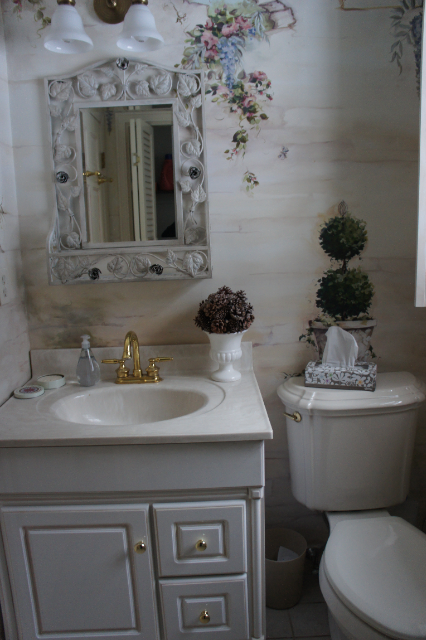 This bathroom looks great Jessica - you can see all of your time and efforts have paid off! We are looking to do the same within our house and would like to use your design to drive our build. Are there online build plans you referenced to build out the 5X9 room? Any help you can provide is greatly appreciated! Thank you! I didn't utilize any build plans. 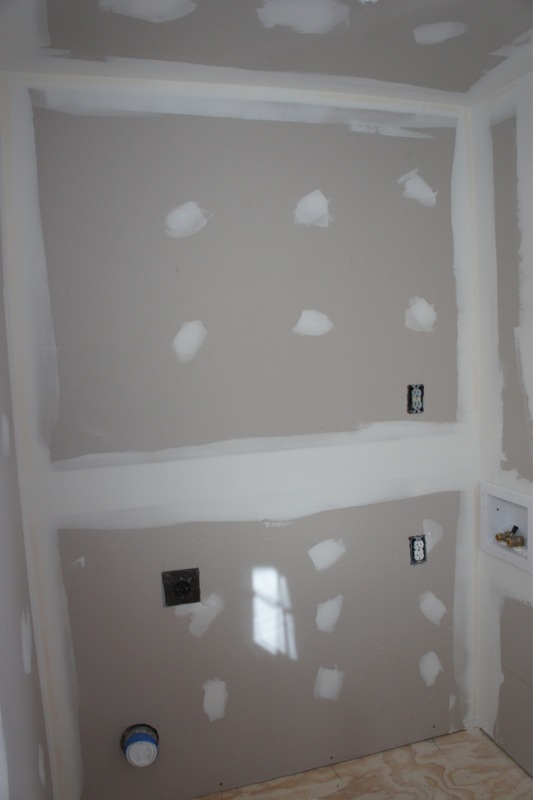 I worked with the existing layout and plumbing and had a contractor spec everything out for me. I'm sorry can't be more helpful! Hi. What size hex tiles did you use? 2"? Where did you find the tile? Also what color grout did you use? Thanks in advance for any info. I'm researching all over looking for inspiration and advice for my master bath remodel. This is so cute! We are also in the process of a half bath remodel, and I love your light fixture! Where did you get it from? I found this through Pinterest and thought - cool that bathroom looks like mine (the after) and I also have the pic of the girl in my daughter's room. Love the tile on the floor! That we don't have ;). Thanks, Stephanie! That painting of the girl is great! Wondering if you can tell me the height of your appliances? Most front loading machines I've seen use pedestals, but adding a counter top would make that way too high for my 5 foot self. Yours do not appear to have pedestals---is loading or unloading a problem for you? Sorry, I no longer live there! I bought Samsung front loading washer and dryer without the pedestal and it was not too high. I am 5'3"
Love your bathroom! Would you mind sharing what brand/where you got the sink? Or maybe a model name if it has one? Hi! 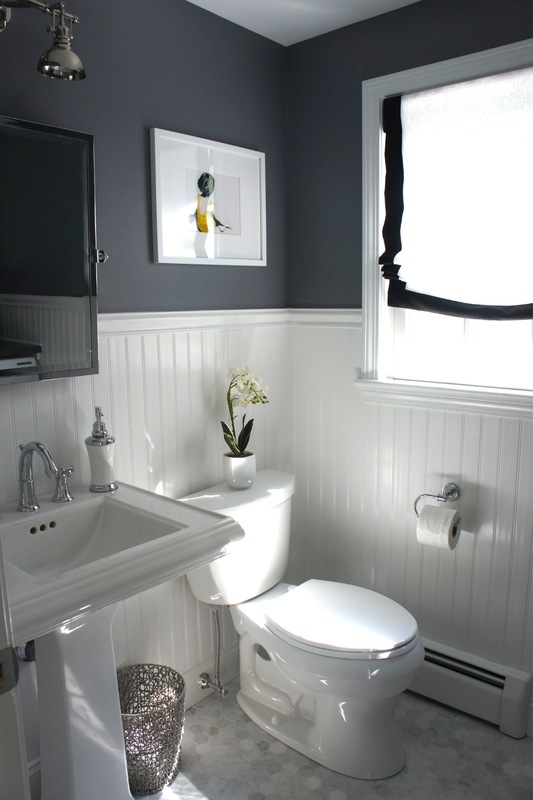 I love the bathroom paint color! Do you know what paint color you used for that? Thanks and great job! Hi! Your bathroom is beautiful! Do you know what paint color you used in there? Thanks! Love the wastebasket! Can you let me know where you bought it? Where did you get your window treatment from? Whee did you get the window treatment from? Great transformations! I was wondering, with the shelf directly on top of the washer and dryer, how do you clean out the lint filter in the dryer? I think I have this model dryer, Emily. The lint filter is located near the drum, so you empty it when you open the door of the dryer- no access to the top of the unit needed! Wow! What a great transformation! So inspiring! Love this! What's the gray paint color called? Love the bathroom! What style faucet is that? Hi can you tell me where the picture is from above the washer & Dryer? I actually bought it at HomeGoods. Can you please tell me where you got your faucet? I see your light is polished nickel, are your other fixtures the same? Hi! This is the faucet. http://www.americanstandard-us.com/bathroom-faucets/Portsmouth-Widespread-Faucet-w-Cross-Handle-4243/ All the other fixtures where either polished nickel or chrome. They are very close in color. What does the flooring look like? We love it all and likely will do something similar. I love your space and I'm right in the middle of a laundry/mudroom redo. I know you've answered in the questions above where you got your cabinets from, but I'm curious the dimensions of them. I'm thinking of doing a similar look with mine. Also, how did you get the shelving between the cabinets? Is it one long shelf that the cabinets are over? Thanks for any info. Hope you're still enjoying your beautiful space! Thanks! I'm sorry but I do not recall the dimensions and I don't live at that house anymore. The shelf and brackets are from Ikea. The shelf can be cut to the size you need and the rough edge is hidden in the bracket. I installed the shelf after the cabinets were installed and it fits snugly between them. You have to first put the shelf in the brackets, place it between the cabinets and then screw in the brackets. It's a two person job. This looks great!! 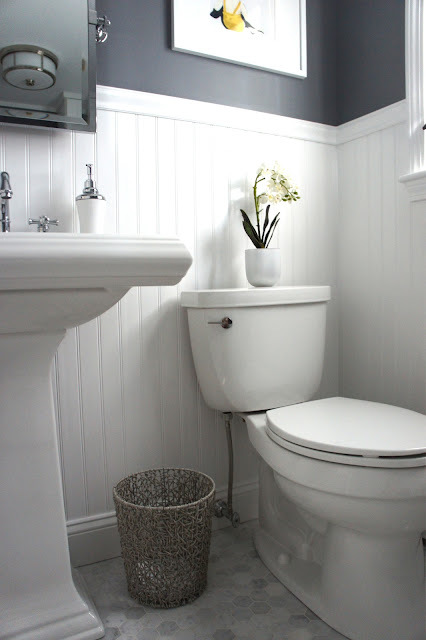 What paint color did you use in the bathroom?! I, also, love your laundry room! My cabinets are laid out the same. I was wondering where your found the light fixture in the LR? Is it flush mount? The ceiling is low in my room. Thanks so much for sharig. Love your laundry room. I am finishing my remodel as I write this. I am looking for a light fixture like the one you have in your LR. Would you please tell me where you bought it? I have always heard that copying is a form of flattery! Thanks so much for posting. Love the look. Where did you find your mirror for the bathroom? where did you get the cabinets? what size are they? I'm getting ready to remodel our downstairs bathroom/laundry room EXACTLY like this!!! Love it!!! After researching a little, I found a comparable mirror on wayfair, the light fixture on the ceiling at Lowe's. Found the flooring at my local flooring store and then once I got the item number off it, looks like everyone has it. Absolutely LOVE your laundry! It is the top inspiration for what I will be doing to my laundry. But on a budget! I should start a blog also. We just replaced the green carpet in the kitchen/dining area and repainted. Anyway you've done a fab job! can you tell me where the flushmount ceiling light is from? thanks so much! love your space! Hi! Looks great! We just did a very similar remodel all ourselves and we only have one thing left:the countertop. How much was the piece of countertop you used? And was it a custom cut? We're finding that everything in Stock in stores is only 2' deep so it doesn't come out quite far enough. Beautiful makeover! It turned our so bright and airy! love it! Wow, that is a lovely remodel! You should feel great about that.Congrats! Jessica. This bathroom is a wow!!! I love it so much. The old one was different but your knew is out of the park. Love your bathroom! Did you put the headboard over or under the trim?